After inserting my ATM card and PIN, I select the option (an automatically generated button) to repeat a recent past activity: withdraw $40 from my primary checking account. 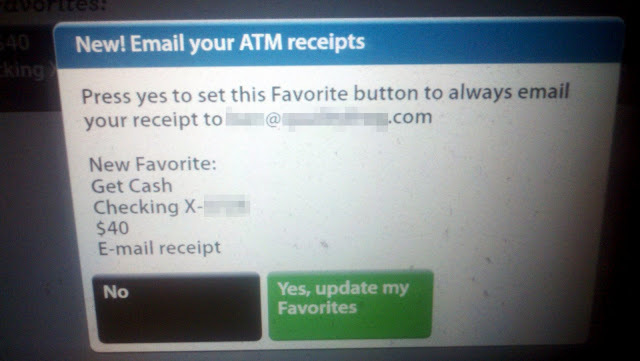 In the past, selecting this option has resulted in the ATM dispensing cash and returning my card without further interaction. However, this time, an unexpected pop-up dialog window fills the screen. The familiar option to quickly repeat my last ATM transaction (withdraw $40 from checking) is interrupted by an unexpected request. The title of the dialog mentions emailing ATM receipts but the big green button says something about "Favorites". The dialog doesn't ask a question that is clearly linked to the response buttons. It says to "Press yes", but doesn't clearly state what happens if I press the "No" button. The dialog text mentions "this Favorite button" but doesn't identify what is "this" or what is a "Favorite button". It doesn't seem to be any of the buttons currently displayed. The dialog includes "set this Favorite button", "New Favorite", and "update my Favorites" without identifying what these are. Are these all the same thing? If so, why use different phrases to refer to the same thing? Does emailing a receipt mean I don't get a printed receipt now? What if I want a paper receipt and an email? What if I want the receipt emailed this time but not "always"? It may seem that pointing these out is nitpicking, but the inconsistencies, ambiguity, lack of privacy, and unexpected appearance of this dialog added confusion to what is typically an quick activity that doesn't require much thought. Few people actually want to use an ATM; most just want to get their money. And to top it all off, pausing to repeatedly read and understand this dialog triggered a timeout that made the machine beep loudly and drew attention to me and the machine. I find this infuriating in any kiosk application, but almost unforgivable at a kiosk where one wants privacy and security to withdraw one's money.